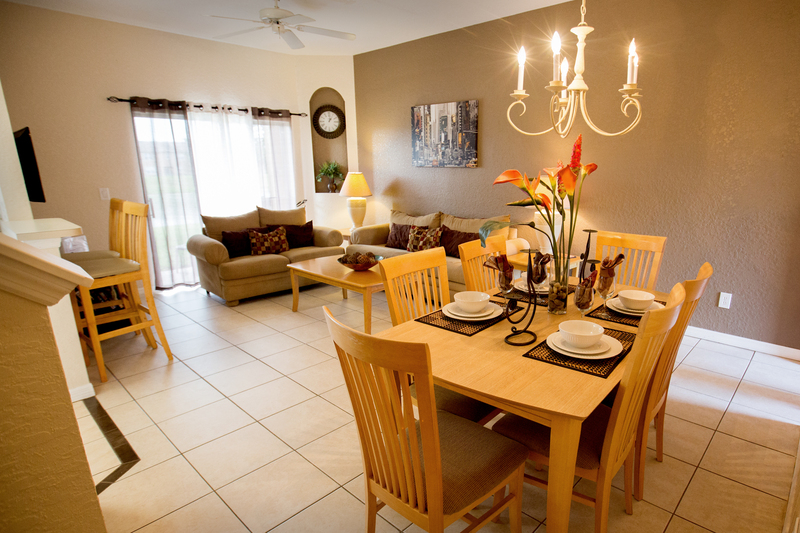 Our villa is a stylish 4 bed/3 bath villa located at the prestigious Regal Palms Resort & Spa with waterpark & clubhouse. 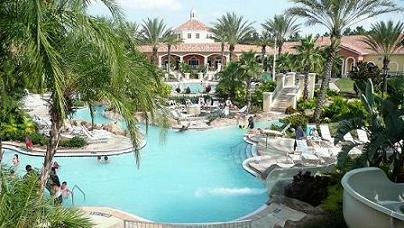 A Triple AAA/CAA (3 diamonds) & The Guild of Florida Owners (5 star) rated resort. The resort is the perfect choice for families, combining the facilities of a resort with the privacy and independence of a private villa. 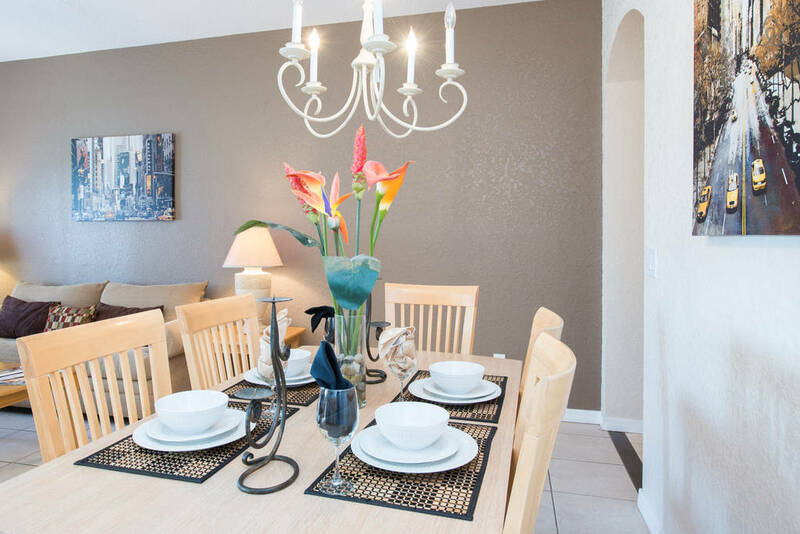 Villa Betty Boo 2 is located in a quite street only a 2 minute walk from the pool complex and clubhouse. We have flat screen cable tv in all rooms free wireless internet in villa with free national & international calls, plus playstation 2 games console. 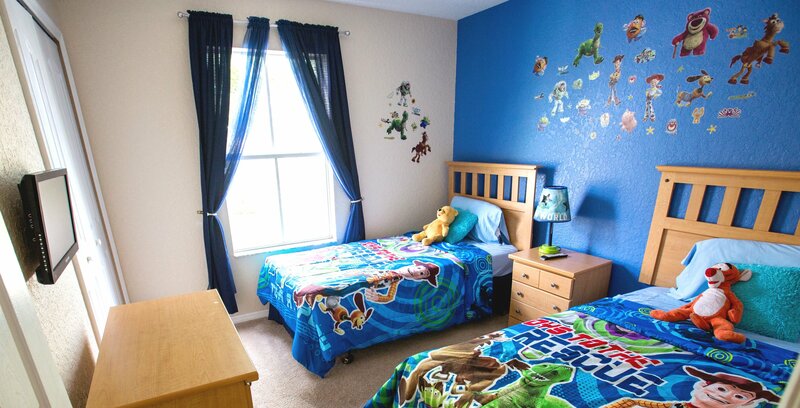 We also offer a cot, high chair and stair gate for families with young children, free of charge. 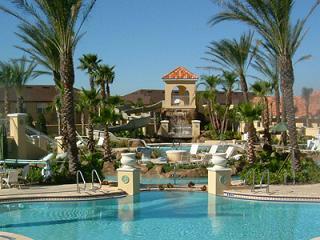 We are loacated very close to Orlando's Theme Parks, 10 minutes from Disney, 20 minutes to Universal. 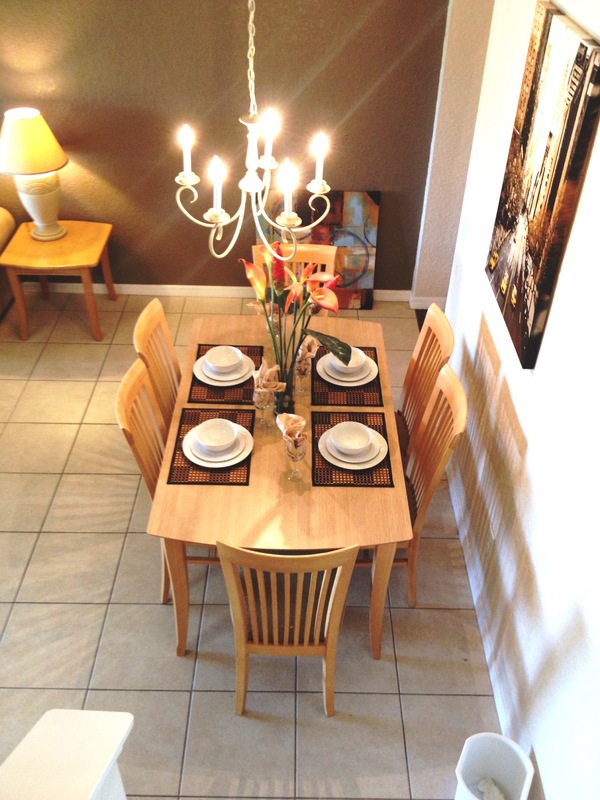 Our Villa has 4 bedrooms & 3 bathrooms, the 2 master bedrooms are ensuite with the 2 twins sharing the 3rd bathroom. 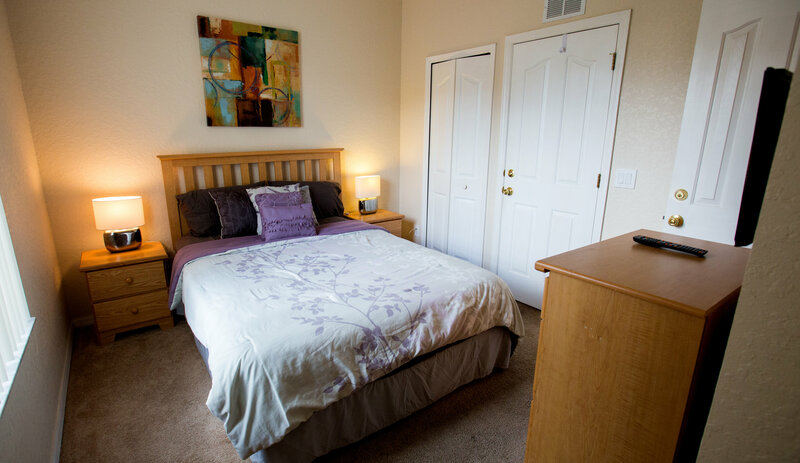 THE FIRST MASTER BEDROOM upstairs has a huge king size bed with flat screen cable tv and large bath with shower, it also has has a walk-in wardrobe and ceiling fan. 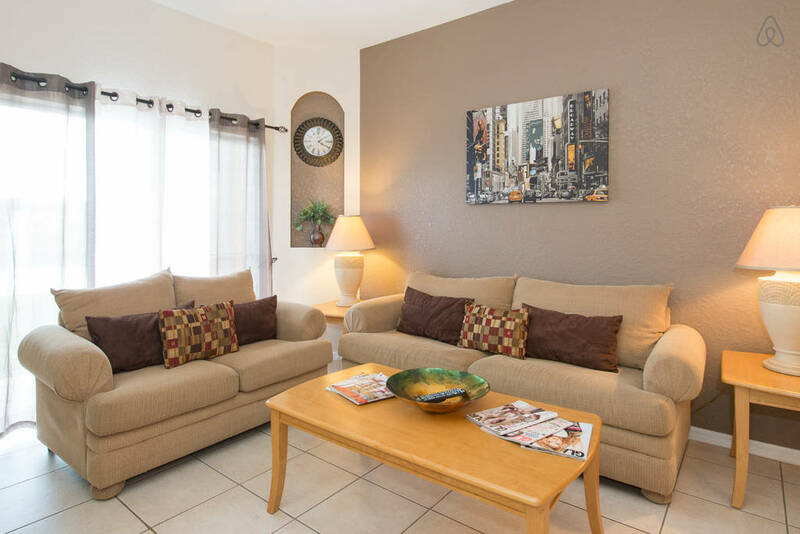 THE SECOND MASTER is downstairs and has a seperate entrance, with flat screen cable tv and ceiling fan also. 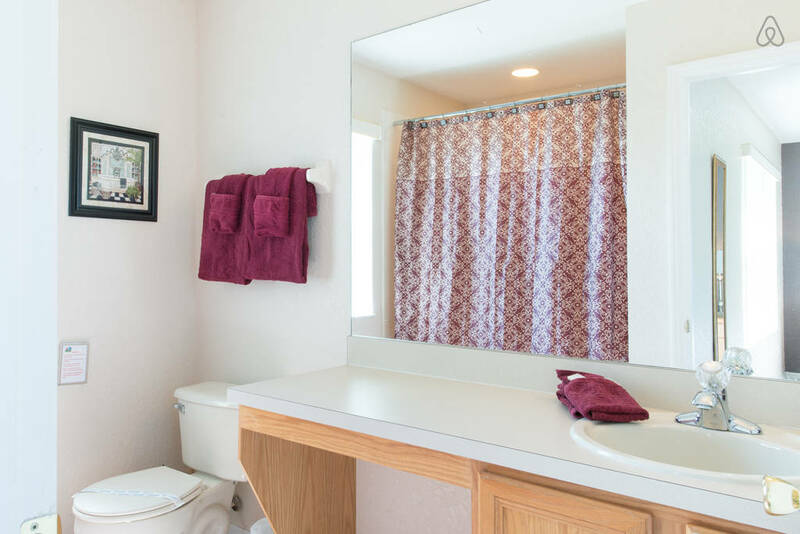 Both Master bedrooms benefit from their own private en suite bathroom. 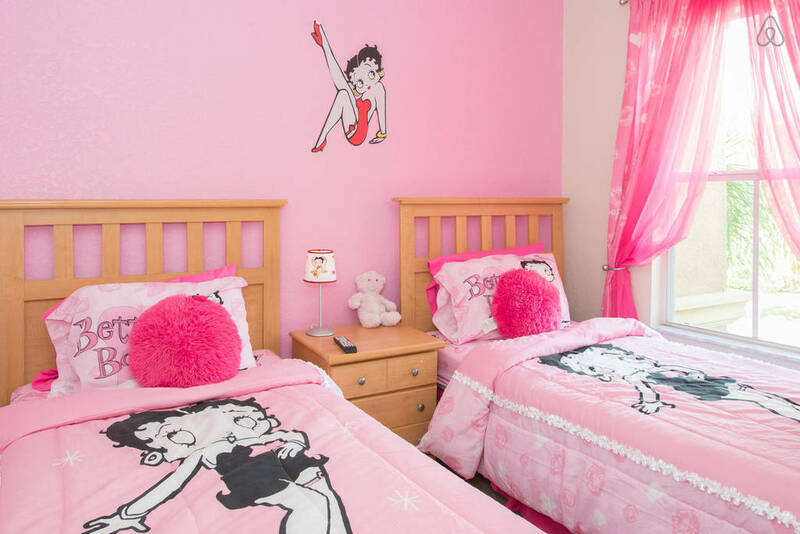 THE FIRST TWIN bedroom has a Betty Boop theme with flat screen cable tv and shares the 3rd bathroom upstairs. 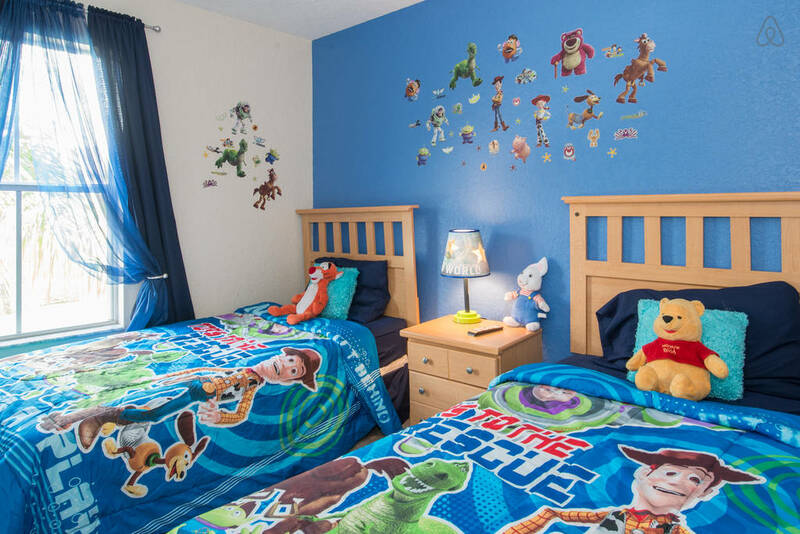 THE 2ND TWIN is a Toy Story themed room with flat screen cable tv & PS2. All wardrobes are doubles. 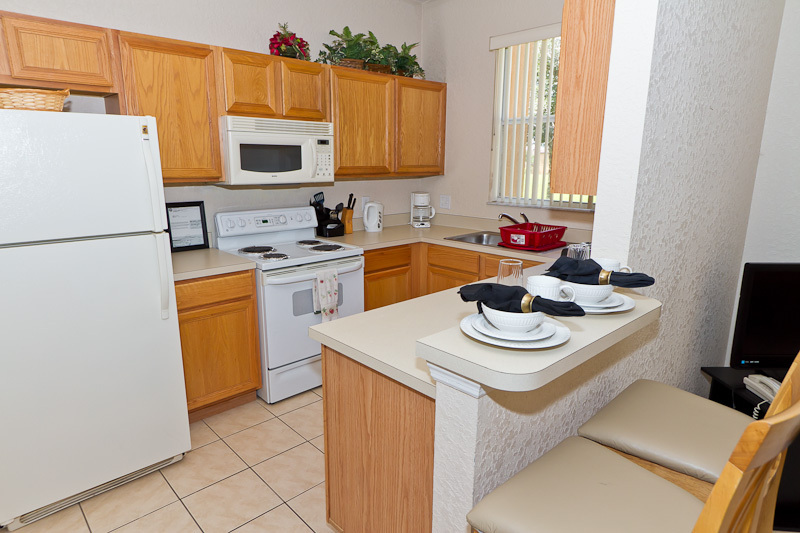 Our Villa has a fully equipped American kitchen with mmicrowave, toaster fridge freezer and all the crockery and utensils you may need. There is a utility room with washing machine & tumble dryer. THE LOUNGE/DINING ROOM has dining table with 6 chairs, 2 sofas (one is a sofa bed) and a coffee table, this room leads onto the patio. There are ceiling fans in most rooms also. 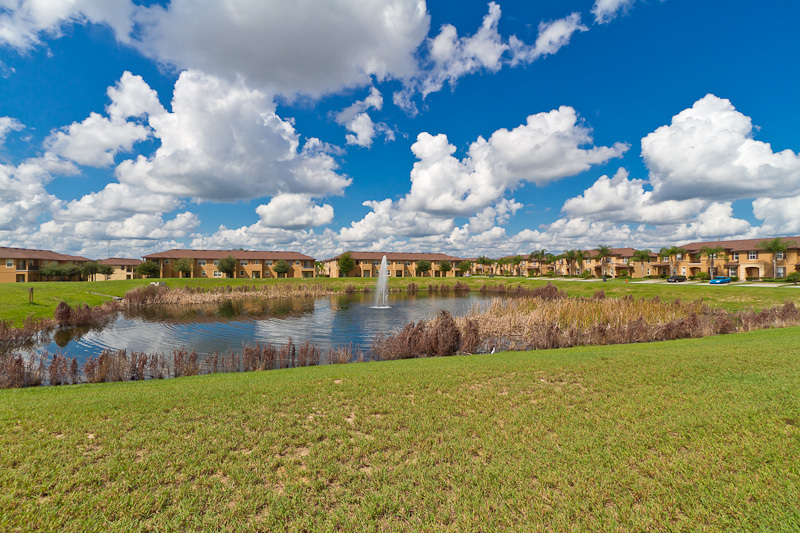 The Villa does not back onto other properties but has a relaxing lake view. There is a communal BBQ for your use. 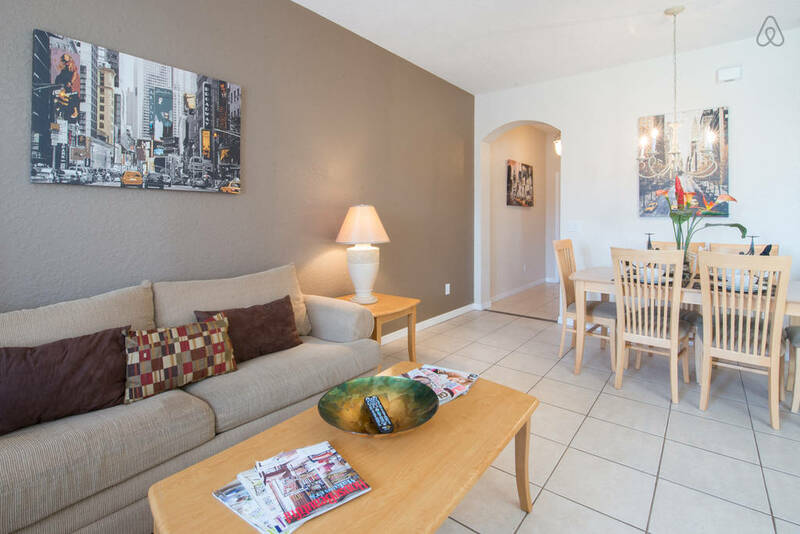 We have flat screen cable tv in the lounge and all bedrooms with dvd player and telephone in lounge plus Free wireless internet. 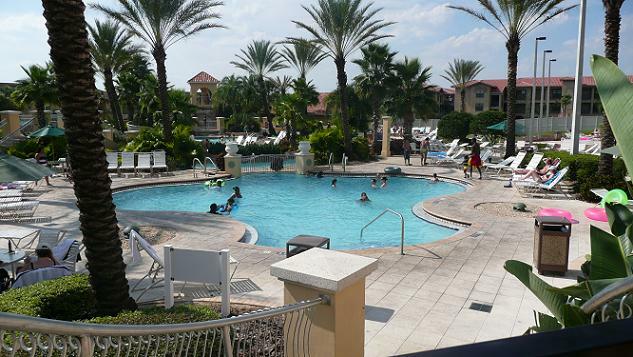 REGAL PALMS RESORT & SPA has it's own on-site private WATER PARK. 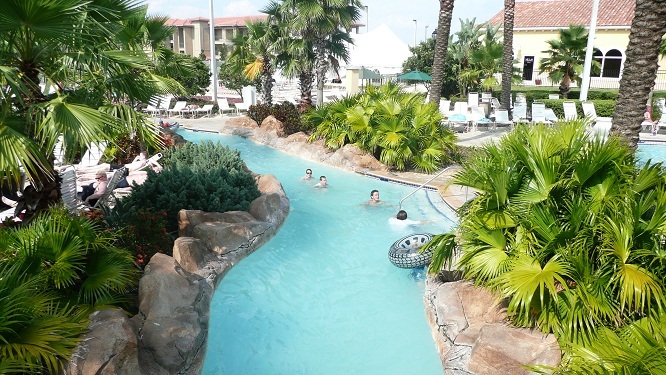 Set in 2 acres of tropical landscaped surroundings, with extensive sundecks, waterfall, 2 large heated pools, one for the adults and one for the children, a LAZY RIVER and WATERSLIDE plus a whirlpool/Spa! 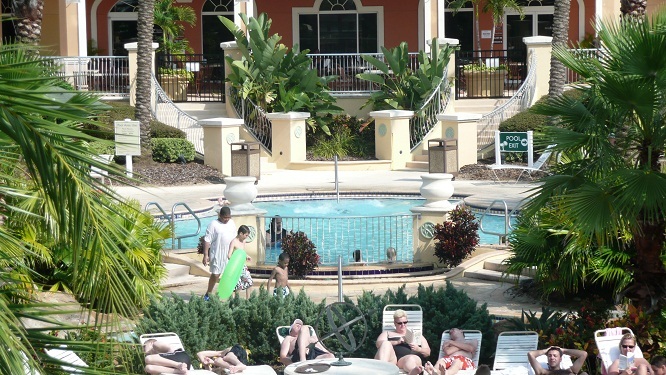 with the added benefit of complimentary towels and lounge chairs along with waiter service for the pool area. 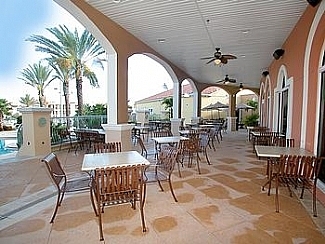 You can pick up the resort wireless internet connection from here and in the bar and terrace areas. 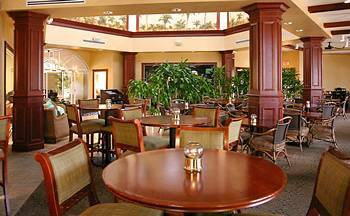 REGAL PALMS BAR & GRILL is open daily offering excellent food and wines for a pleasant casual dining experience. With the added convenience of being within walking distance to your own home, no worries about drinking and driving!!! Whether you choose a light lunch on the Sun terrace or a full meal in the restaurant, there is a wide variety of choices which are very reasonably priced. The Sports bar broadcasts live events from around the world, (English Football too) while there is Live Music most Friday & Saturday nights, with Karaoke on Thursday nights & entertainment most days (in season). BANANA JACKS is a hige indoor play area with ball crawls, climing frames and games machines, there is a cafe here as well. THE SPA HEALTH CENTRE, offers guests Hot Stone Aromatherapy Massage for the body, tropically infused facials, body scrubs, waxing, laser treatments, manicures, pedicures and spray tanning to pamper your every whim, plus a Multi-Jet all-over Power Shower and Spray Tan Room. 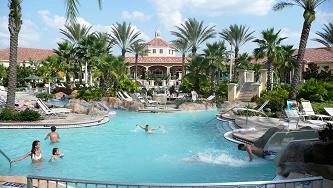 There is over 5,000 sq feet of luxurious indulgence into the world of spa treatments, fitness and wellness. 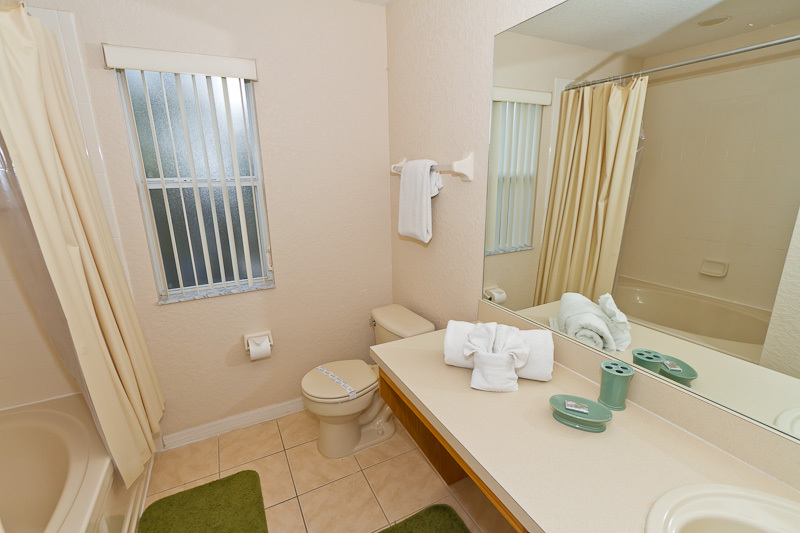 You will find a further indoor heated Jacuzzi/Spa, Sauna Room, and a Steam Room to relax you after an invigorating workout. 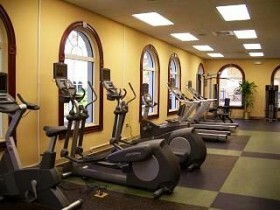 There is a gym with exersise bikes, treadmills & weights. The mirrored exersie room has classes for yoga, pilates & aerobics. There is also a spray tan room (if you need that in Orlando! 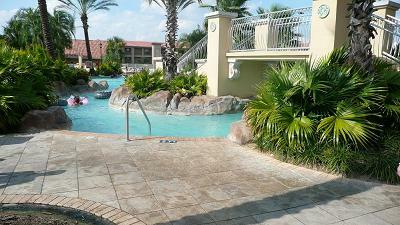 ), jacuzzi/spa, sauna & steam room. Keith Hamilton review: an absolutely fantastic property, supported by the best owners who pride themselves on customer service and this was more than evident by the amount of dialogue and support we received whilst booking this property and even while we were there. 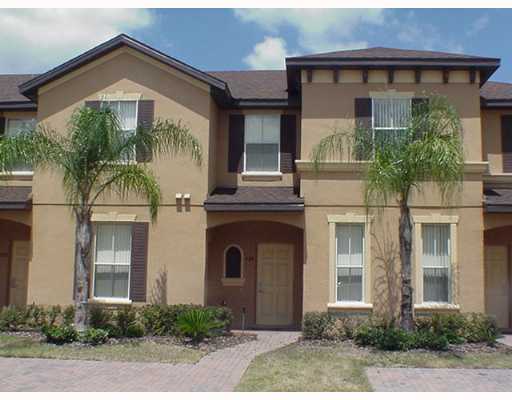 The house is an absolute gem and has everything you need for a great stay close to Disney. We will definitely stay there again and have already recommended it to family and friends. A real credit to the owners.